Adenoma of parathyroid gland is a hormone-active benign tumor. It is accompanied by excessive production of parathyroid hormone and symptoms of hyperparathyroidism. If it is not time to remove, the prognosis may be unfavorable. Adenoma of the parathyroid gland causes the development of hypercalcemia (elevated levels of calcium in the blood and tissues). Hypercalcemia manifests in bone (pathological fractures, osteoporosis), gastrointestinal (pancreatitis, ulcers), kidney (nephrolithiasis), cardiovascular (hypertension) syndromes. Typical symptoms of parathyroid adenoma are loss of appetite, malaise, nausea, vomiting, impaired stool, weight loss, constipation, pains in the bones, joints, muscle weakness. Calcium deposits in heart muscle may cause acute myocardial infarction. When necrosis of the renal tubular developing acute kidney failure. The development of an adenoma is sometimes accompanied by polydipsia (severe thirst) and polyuria (excessive urine), mental changes (depression, memory impairment, convulsions). Due to hypercalcemia observed damage of the joints, dryness and itching of the skin, the deposition of calcium salts in the cornea of the eye, calcification of the auricles. 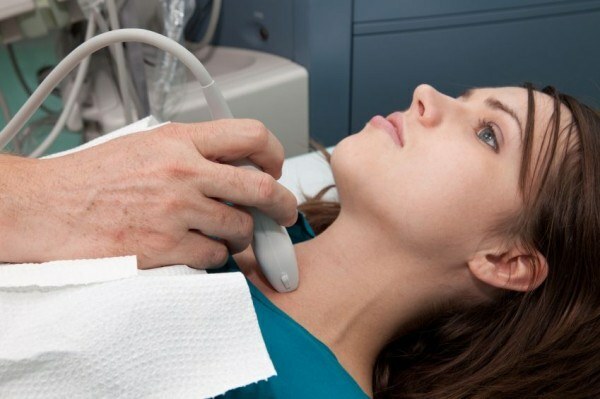 The diagnosis of parathyroid adenoma is put on the basis of laboratory analyses (determination of calcium level, parathyroid hormone, alkaline phosphatase phosphorus, the daily allocation of calcium), x-ray data, ultrasound, CT, MRI parathyroid gland, selective angiography, biopsy including Cytology material. Treatment of parathyroid adenoma surgery. Operation should be done as soon as possible, otherwise the body develops irreversible changes and the prognosis becomes unfavorable. Before surgery is conservative therapy aimed at the suppression of the hypercalcemia. The patient must follow the diet restricting foods with high calcium content. Intravenous bisphosphonates are assigned infusions, isotonic solution of sodium chloride, forced diuresis. How much and in what doses do infusion, should indications be determined by the physician. If you develop hypercalcemic crisis, it is necessary the introduction of a solution of sodium bicarbonate, glucose, corticosteroids, cardiac glycosides. After preparation of the patient performed surgical removal of the parathyroid adenoma. In total hyperplasia or multiple adenomas removed and the parathyroid glands. In the postoperative period is performed to control the content of calcium in the blood, daily monitoring of ECG. Usually after surgery, the calcium level returns to normal pretty soon - within 2 days. In this case, the prognosis is favorable. Bone recovery occurs within two years after surgery. Sometimes you can stay bone deformation in places of fractures that will make it difficult to work. The symptoms of the internal organs and the nervous system disappear in a few weeks. The prognosis is much worse with the defeat of the kidneys, as nephrocalcinosis is an irreversible condition that developed kidney failure can progress. In severe lesions of other organs, the prognosis in a person's life can also be unfavorable.